RSVP to alumni@idyllwildarts.org by Tuesday, April 23rd to confirm your attendance. Special Thanks to Ashley Chui ‘13, Music, for hosting the event. The alumni of Idyllwild Arts are some of the most talented individuals to be entering the workforce. Whether working in their art major, pioneering new ideas or setting new standards in many industries completely different from their course of study, these talented alums are successful in every sense of the word. The Mission of the Idyllwild Arts Foundation is changing lives through the transformative power of art. The Idyllwild Arts Summer Program provides arts instruction and experiences of the highest caliber to a diverse student population of all ages and abilities. Idyllwild Arts’ idyllic mountain setting inspired its name. Set on over 200 acres situated in the mountain village of Idyllwild, Idyllwild Arts is a unique educational institution with a focus in all art forms for all artists of every age and level of accomplishment. Although the Idyllwild Arts’ sprawling and pine-forested campus comprises 205 acres in the San Jacinto Mountains, it is only a short 2 hour drive from Los Angeles and San Diego. Idyllwild Arts has a long and rich history of nurturing the creative talents of thousands of artists. Since the late 1940s Idyllwild Arts has been dedicated to providing the ideal environment for artists in every artistic discipline to seriously pursue their artistic passions. 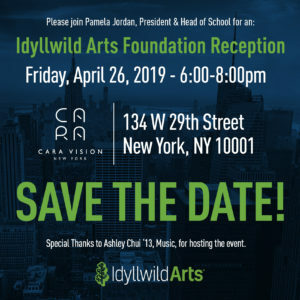 Join Idyllwild Arts President & Head of School Pamela Jordan to learn about Visible Change at Idyllwild Arts! Special thanks to Ashley Chui ’13, Music for hosting the event. Submit a review for Idyllwild Arts Academy and receive $20 from BoardingSchoolReview.com via PayPal! PO Box 38 / 52500 Temecula Rd.